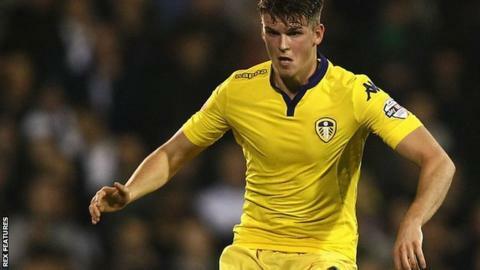 Leeds United head coach Steve Evans remains hopeful that he will be able to select full-back Sam Byram for Saturday's game at Sheffield Wednesday. Leeds accepted a bid from Everton for the 22-year-old on Thursday. "Sam Byram has come into training today (Friday). His advisors are having a chat with Everton, but just because they're talking it doesn't mean it's done," Evans told BBC Radio Leeds. "If it doesn't look like being finished I expect to be able to play him." Byram is out of contract in the summer and has turned down a new deal through to 2017 at Elland Road. He came through the club's academy and has made 143 appearances, scoring 10 times. Evans added: "I'll be very disappointed if he does go because he's been one of our best players in the last six or seven weeks and he's been fantastic off the pitch. "At the same time, we will have sent someone off who doesn't want to sign a contract here and he goes to play in the Premier League. "I'm not 100% sure he'll leave. It might be in the high 90s but until he sits here and shakes my hand then I will still be hopeful." Byram has played 24 times and scored three goals for Leeds this season. Evans, who took over at the Championship club in November, feels that the club should have done more to avoid Byram's contract situation reaching this stage. "It's easy to say but if I had been head coach in the summer then Sam would have signed a new deal," Evans said. "I tried as best I could to get people back around the table but I have to accept that the bridge had broken down a little bit. "For as long as I am the head coach here, we will be doing everything we can to make sure this position doesn't happen again."